FANBOY PLANET.com . : disneyland-treasures-of-asgard :. Just before officially launching the Holiday Season at Disneyland, Imagineers snuck a trip down the Bifrost. The result? If you step into Innoventions (and for the past few years, not many have), you can experience an exhibit of the Treasures of Asgard -- and something more. Actually, last May Innoventions had already ramped up with an exhibit from Stark Expo. The intent had been for that to be temporary, leaving in September, but it's still November and the display of Iron Man armors and the chance to "suit up" via Kinect technology isn't going anywhere. 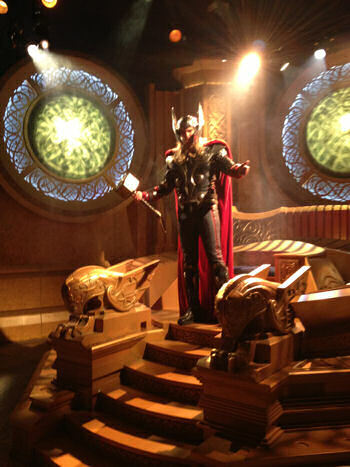 Last weekend, however, it was overshadowed by the chance to see props (or prop replicas) from Thor: The Dark World. No doubt both will stay, as Innoventions is getting much more attendance from Marvel fans than anyone else. How long can they have an exhibit of the futuristic technology of XBox anyway? Slowly, the little corner of Stark Expo will become a full fledged Avengers pavilion. I have no proof; it is just too logical to ignore. To find your way to it, you must go past the still fun distractions of Buzz Lightyear's Astro Blasters and Star Tours. 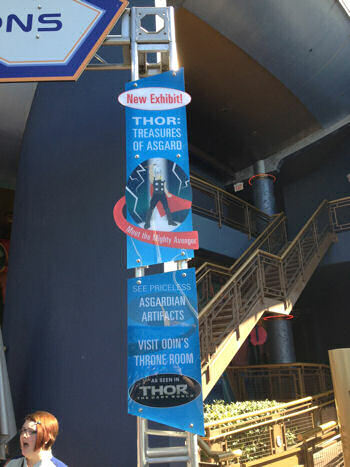 Just to the left of the Pizza Port stands a stylized but relatively small banner touting the cultural exchange exhibit that is the Treasures of Asgard. Yes, the best part of this is that they're not being presented as a display of props, but as a continuation of our existence on Marvel Movie Earth. 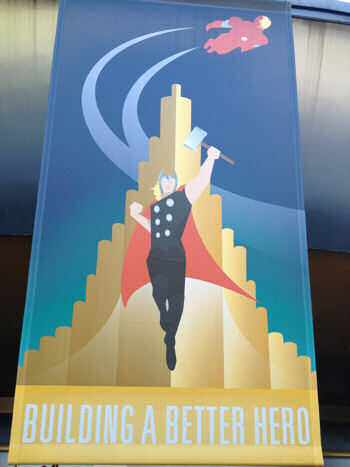 Though the banner does acknowledge Thor: The Dark World -- that's for outside; inside, we're in Marvel World. Jarvis narrates the Iron Man exhibit, and signs for Treasures of Asgard explain the unprecedented cooperation between Dr. Jane Foster and Odin. The All-Father has cautiously allowed this exhibit since the New York Incident made it clear mankind had to know of Asgard's existence. The line doubles back past an exhibit of weaponry. Various swords and shields of Odin's elite warriors hover in glass cases. Belying how truly valuable to Asgard the Warriors Three are, the swords for Fandral, Volstagg and Hogun sit outside the main chamber. Perhaps it's for the best as you wait for the central gallery to open. And then it does. 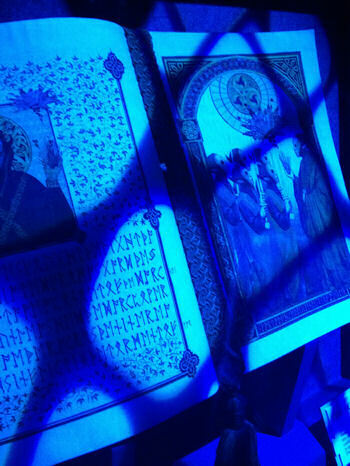 A group of about 25 are allowed in to a small room full of more treasures, with some clever choices. For some reason, including an Asgardian child's toy makes these "gods" seem all the more human. Then you swing around and see Heimdall's weaponry. Tying closely to The Dark World, the display cases include the Book of Prophecy that explains the Dark Elves' plans, though it is written in Asgardian runes. Nearby is Loki's helmet and the manacles that we all remember he wore when Thor took him away to face justice after the Battle of New York. As you absorb all that, the All-Father speaks, welcoming you to this exhibit. He has instructed Heimdall to activate the Bifrost and allow you to visit his special receiving Throne Room. Though Odin has addressed us, he knows who you really want to meet. And yes, the God of Thunder is there, kind and warm, friendly to small children but you really get the idea he might just as well join you in lifting a glass of mead. It seems to be a fun and meaty actor's role, with plenty of room for improvisation and clear beats that must be hit. Thor greets us, and speaks a little bit about Mjolnir. The script to that is a little clunky, but nobody cared. Our group had very few children but not one cynic. There were grandfathers who wanted a picture with Thor. And after a routine involving Mjolnir's heaviness -- maybe Disney could veer from the script occasionally and allow little kids to be worthy -- everyone got a chance to take pictures with Thor. That makes for an impressive capper to the experience. The line outside may be long, but it's because each and every person who wants to have a moment suspending their disbelief and posing with a superhero can have it. Attendants took individual pictures of everyone. My favorite moment, and proof that Disney takes a careful eye at casting, came when a small boy shyly held out an autograph book. Thor knelt down, and as he signed, barely broke eye contact with the boy as they talked quietly about being a superhero. Just a beautiful moment, and even though some of the set dressing was clearly not budgeted at "be here more than a couple of months", everybody wanted to believe they were really in Asgard for a bit. Through sincerity, Disneyland worked magic on everyone in the room. If the park could achieve that without committing to it being a long-standing attraction, just think of what they could do if they admit it's going to be around for a while. Commit, and dazzle us even more. Now is a great time -- the park has overlaid the Haunted Mansion, of course, with Jack Skellington and his Nightmare Before Christmas. New Orleans square has gingerbread beignets. And for the first time, the Jungle Cruise got into the act, becoming the Jingle Cruise. Most of that is a change in the patter, but the effort is appreciated. What is Christmas in Asgard like, anyway?